As you know Michelle and I are from Texas and in Texas football ain’t no joke y’all! We do football right and we plan parties around football better than anyone else. And, the best thing about football parties you ask the FOOD! 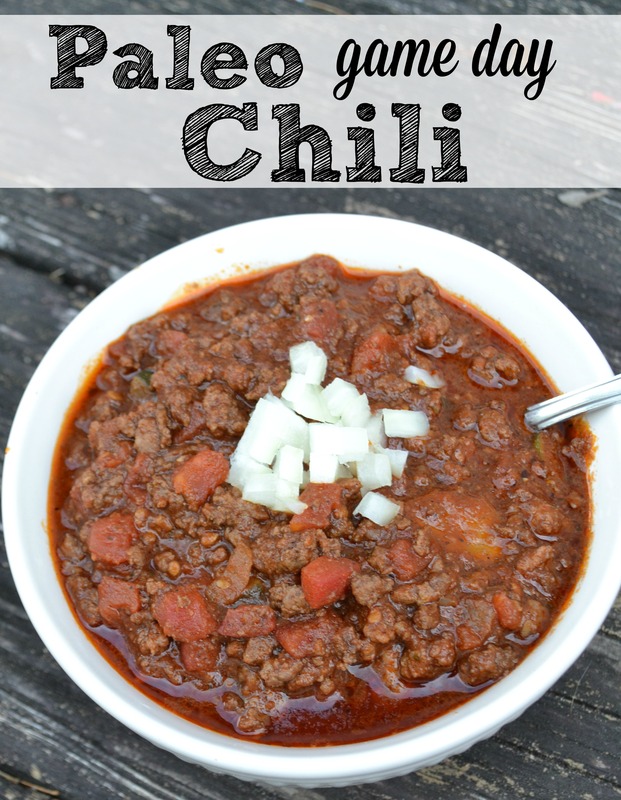 It’s good ole stick to your ribs yumminess and this Paleo Game Day Chili is perfect for Superbowl Sunday. Not only is it delicious but you can eat as much as you want knowing that it is actually good for you. This recipe is a fave in our house and one I have made many times for family and friends. It never fails that when I make this chili the pot is licked clean and there are zero left overs in site. Let your coconut oil melt down on medium heat and add your onion. Once the onion is soft, season with a dash of your salt and a pinch of your chili powder. *The secret to this recipe is to season as you go. Each layer needs a little bit of something! Add your zucchini and sautee in the onions for about 2 minutes. Now, add your ground beef and let it brown with your onions and zucchini. Add a tablespoon of chili powder and paprika and a bit of salt. Next, add your canned tomatoes and 1 small can of water. Then add the rest of your seasoning and stir in well. Now the hard part. You have to wait and let this awesomeness cook down for at least 1-2 hours. The longer it cooks the better it tastes! As your chili cooks the liquid will thicken and it will now look more like a traditional chili. Of course this is a Paleo Chili so if you are looking to stick on diet garnish with some onion and sliced avocado. But, for your guests who are looking to splurge on Superbowl Sunday you can serve the chili topping staples like fritos, shredded cheese, and sour cream! So tell us, are you planning an over the top Superbowl party this year or will you hang at home with the fam? It looks like we may be partying it up together with some of our favorite blogger friends! And, don’t forget to check out The World’s Best Sausage Dip and Paleo Sausage Balls for your party as well!